U.S. Files Lawsuit Against Volkswagen Over Emissions Trickery : The Two-Way Volkswagen has acknowledged that millions of its diesel cars worldwide relied on a ruse to skirt emissions controls. The EPA says the two sides haven't agreed on how to handle a recall. 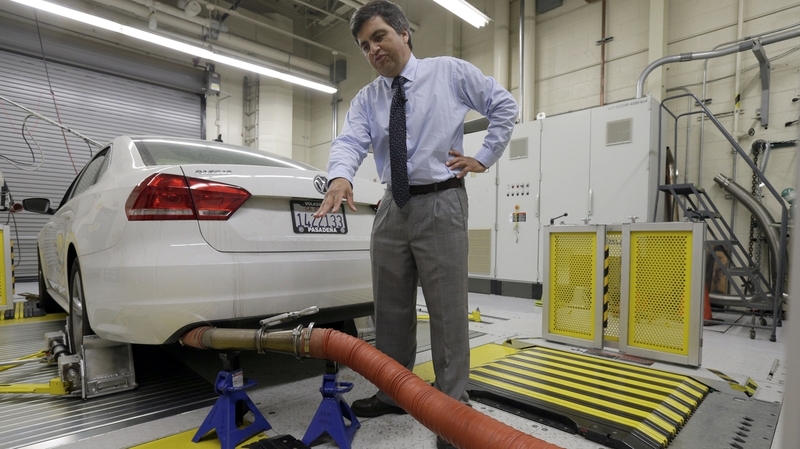 John Swanton of the California Air Resources Board, explaining how a 2013 Volkswagen with a diesel engine is evaluated at an emissions test lab. The U.S. has filed a civil complaint against Volkswagen over emissions cheating in its diesel cars. Volkswagen's use of a "defeat device" to fool U.S. regulators has resulted in a federal lawsuit against the company. Volkswagen has acknowledged that millions of its diesel cars worldwide relied on a ruse to skirt emissions controls. The civil complaint was filed in federal court in Detroit, with the Department of Justice acting on behalf of the Environmental Protection Agency — which says it hasn't yet reached an acceptable agreement with Volkswagen over how to handle a recall. The carmakers' vehicles were actually putting up to 40 times more pollution into the air than is allowable under U.S. standards, the EPA has said — despite the vehicles' being awarded clean emissions credentials that triggered hefty federal tax credits. For instance, in 2009 (the first year covered by the EPA's complaint), Americans who bought diesel-powered VW Jettas earned a $1,300 credit. "With today's filing, we take an important step to protect public health by seeking to hold Volkswagen accountable for any unlawful air pollution, setting us on a path to resolution," Cynthia Giles, assistant administrator for enforcement and compliance assurance at EPA, says in a news release about the lawsuit. Giles added, "So far, recall discussions with the company have not produced an acceptable way forward. These discussions will continue in parallel with the federal court action." "The DOJ alleges that nearly 600,000 diesel engine vehicles had illegal defeat devices installed that impair their emission control systems and cause emissions to exceed EPA's standards, resulting in harmful air pollution. "The complaint further alleges that Volkswagen violated the Clean Air Act by selling vehicles that were designed differently from what Volkswagen had stated in applications for certification to EPA and the California Air Resources Board." The EPA's claims shocked and angered many Volkswagen owners; the case also led a House committee to call Michael Horn, the CEO of Volkswagen's U.S. business, to testify on Capitol Hill. As we wrote at the time, when he was asked whether software that turned off vehicles' emissions controls unless they were undergoing an official test was installed "for the express purpose of beating tests," Horn said that to his knowledge, "It was installed for this purpose, yes." The scandal resulted in the resignation of Volkswagen's CEO, Martin Winterkorn, weeks after the EPA released its claims. Since then, the company's stock price has taken a hit, and it faces billions of dollars in potential fines. Volkswagen has promised to retrofit cars with systems to limit emissions. News of the U.S. case against Volkswagen comes one day before the company's executives are slated to unveil a new concept car at the Consumer Electronics Show in Las Vegas, in an appearance that's meant to focus on the carmaker's future plans.